Get your talking newspaper online, on smartphones and tablets. Traditionally talking newspapers were analogue recorded, duplicated onto cassette tape and manually delivered usually by the royal mail. With changing technologies, cheaper duplicating and easy distribution of digital media, new methods have materialised. The modern talking newspaper records digitally and can use the digital recording in a variety of ways to enable listeners a choice of receiving their audio. The USB stick has proved to be a firm favorite with many talking newspaper organisations. The USB stick usually contains a number of MP3 files that can be read by USB input audio equipment such as boomboxes. These mp3 audio files can also be uploaded from the USB stick onto a website. A website is made of two parts. The domain name (such as talkingnewspaper.org.uk) and the host, a large computer where these mp3 files can be accessed by everyone throughout the world. The domain name simply points to these files. Companies such as justhost.com, godaddy.com offer domain name and hosting products. To upload mp3 files, a file transfer protocol utility (FTP software) is required. For windows use core FTP and for apple mac use filezilla. Once the files are uploaded to your hosting site a rss feed needs to be added to inform other audio programs of your existance. An rss reed is a text file informing other wesbsites and digital products to the contents, description, date and location of the mp3 file. For apple mac use creating use feeder from re-invented software and for windows use rsspublisher. These feeds can be sent to companies such as itunes, tunes-in, iblink radio and stitcher for publishing in their podcast section. The sonata plus uses rss feeds to add information to it’s menu system. Submit your rss feeds to stitcher, itunes, tune in, iblink and wireless for the blind. The process of updating rss feeds can me time consuming and complicated. 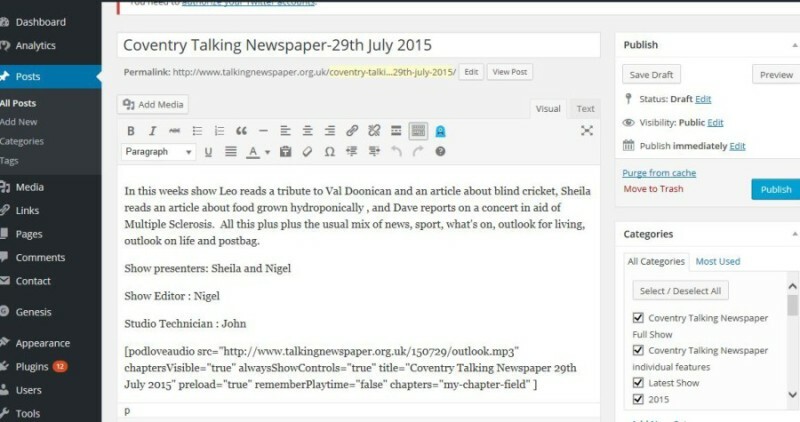 At talking newspaper Coventry, we moved to using a content management system (CMS) to create our website and the rss feeds became auto-generated from the updates our members added. A cms is a program where all our users can log into to update information to the website with little computer knowledge required. Most newspaper style websites use a CMS. It’s more like using a word processor than creating a website. We use wordpress blogging system with a news theme layout from studio press. WordPress can usually be auto installed by the hosting company of your website. Various themes are available online free and premium to display content in suitable layout. Our members login, update the relevant categories with articles that link to the mp3 file locations and the RSS feeds are auto created. The website auto updates the front page with the latest articles. We have a category view website on wordpress called “full show” where we add the locations of each weeks show mp3 file. This category produced the rss file located at feed://www.talkingnewspaper.org.uk/category/coventry-talking-newspaper-full-show/feed. This location is where all other external sources gain their updates from. External sources such as iTunes, tunein and sonata all gain their updates from this automated feed. Using WordPress is easy for all volunteers to use and add information. Following logging in a user can add a post by clicking on the posts option and selecting “Add New”. A new page opens with a text box enabling the user to type details of this week show. After selecting the correct categories and adding the podcast location details provided by our studio engineers, this weeks show is ready to go live online. At this point publish button can be clicked. If the podcast has not yet been produced, the draft option can be selected instead. WordPress is one CMS system and the most popular by a huge majority. Joopla and Drupal also get frequent mentions. In the UK wordpress is used by the express and star in the west midlands and a handful of international newspapers as well. Other CMS systems for newspaper style content are available and discussed online including escentric, atex and saxotech. Finally we can add information about your talking newspapers audio output onto this site. Just email us via the contacts button at the top of the page.